When it comes to feeding your body, nothing beats real food. 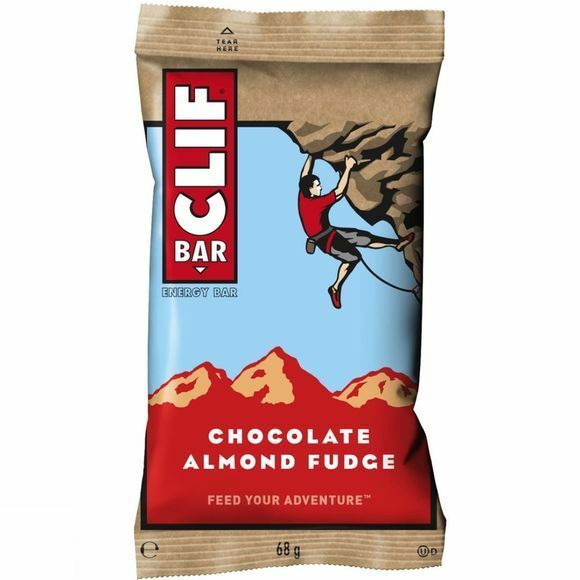 With a mix of whole grains, protein and fibre, the legendary Clif Bar gives you sustained energy for your workout, you workday or your weekend adventure. Brown rice syrup, rolled oats (17.4%), cane syrup, roasted soy beans, soy flour, soy rice crisps (soy protein isolate, rice flour, rice starch, barley malt extract), chocolate chips (4.9%), dried cane syrup, unsweetened chocolate, cocoa butter, emulsifier: soy lecithin, vanilla extract, almond puree (4.8%), fig paste cocoa (3.4%), almonds (3%), oat fiber, sea salt, flavouring, apple fiber, inulin (chicory extract), psyllium antioxidant: tocopherol rich extract (soy), vitamins and minerals: calcium salts of orthophosphoric acid, magnesium oxide, L-acorbic acid (Vit C), DL-alpha tocopheryl acetate (Vit E), beta carotene (Vit A), niacinamide (Vit B3), riboflavin (Vit B2), thiamine mononitrate (Vit B1), pyridoxine hydrochloride (Vit B6), ergocalciferol (Vit D2), cyanocobalamin (Vit B12).